Very early in the trip, Jim struck political gold outside of Galena, Illinois. The same dealer had a number of good political items, and Jim purchased two of them. Jim was off and running. Surely, this was a sign that he was going to find lots of things to add to his presidential campaign memorabilia collection. Sadly, it was not a sign. Indeed, aside from a couple of pinbacks, these were the only items he found. Still, it isn’t every day that one finds something from the campaign of Franklin Pierce. 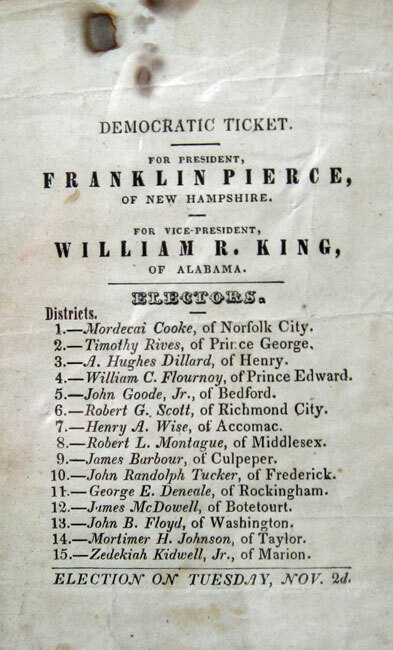 Franklin Pierce was the Democratic candidate in 1852 running against Winfield Scott, the last Whig candidate. Successfully elected, he has gone down in the history books as one of our worst presidents, usually joined at the bottom of the list with his successor James Buchanan and Warren G. Harding. This paper ballot out of Virginia was typical of those used in the mid-nineteenth century. Notice that the voter is choosing electors, not directly voting for the president. Technically, we still do that; we just don’t see the list of electors anymore. This marks only the second Franklin Pierce item in Jim’s collection, so he was quite pleased to find it. This window decal from 1932 has great graphics and an ironic message. Clearly, the elephant is oblivious to the angry donkey coming at him. By 1932, the country was mired in the Great Depression with no relief in sight, and Herbert Hoover was receiving most of the blame. 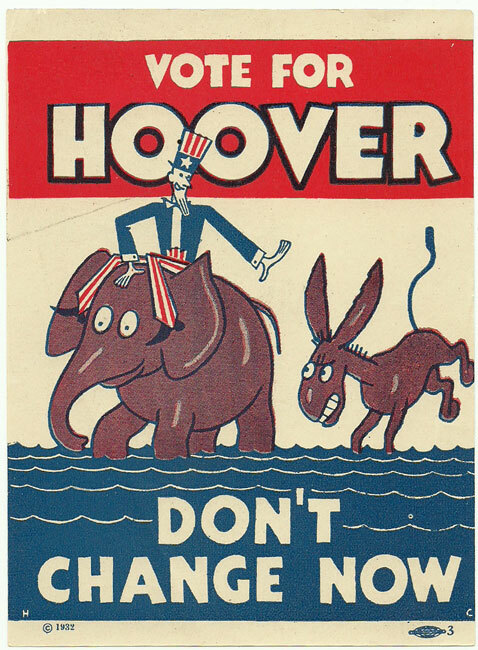 Referencing the old adage, “Don’t change horses in the middle of the stream,” this decal did little to stop the juggernaut that was Franklin D. Roosevelt. Americans wanted change, and they swept FDR into the White House by a landslide. This entry was posted in 1800's, 1930's, Americana, Carol, Jim, Political. Bookmark the permalink.